Update 1:00 a.m.): Foo Fighters, Run the Jewels and Billy Idol were festival favorites again this Friday, and attendees got to see some Weekend Two exclusives including The Nightowls and Future, who made a guest appearance at Drake’s set last weekend. Since the festival was approved for a second weekend in 2012, Weekend Two has been plagued by rainy days and muddy grounds. Although festival-goers can’t count themselves in the clear yet, Friday seems to have broken the Weekend Two curse. While Weekend One saw a few famous faces such as “Gilmore Girls’” Jared Padalecki and Bonnie Wright from the Harry Potter series, Weekend Two brought Shia LaBeouf to the city. According to several reports, Austin Police confirmed LaBeouf was arrested and charged with public intoxication on Sixth Street tonight. Update (12:30 p.m.): The Foo Fighters took fans by surprise this weekend by announcing they had recorded five new songs the night before. Grohl made it clear he wasn’t ready to share the tracks just yet, but he gave fans hope for a new Foo Fighters’ album. Later during the show, Grohl made one fan’s day when he asked them to give him their sign — an oversized cutout of drummer Taylor Hawkins’ head. The cutout sat on Grohl’s throne for the rest of the band's set as Grohl danced with it, kissed it and dramatically sang “My Hero” to it. Update (9:30 p.m.): With songs such as “Barcelona” and “Budapest,” it’s clear George Ezra finds inspiration for music through travel. During his performance at Austin Ventures stage, he told audience members his experience wandering Europe stimulated his travel-theme songs. The British singer filled his set with tracks off his only album Wanted on Voyage, including “Listen to the Man” and “Spectacular Rival.” The show started off slow, with most songs sounding the same because of the singer’s deep and often monotonous voice. The soft maraca-shaking and light drumming coming from the band created a relaxing but sometimes boring atmosphere. Near the end, however, Ezra showed some variation. As the sun set behind the stage, he began playing darker tracks, rather than the happy-go-lucky tunes that filled the majority of the show. Ezra rounded out the performance by saying this was the last festival he’d be performing at this year, but he was glad it was this one. He ended with “Did You Hear the Rain?” which culminated in a moment of heavy guitar and flashing lights that contrasted with much of the performance in a great way. Update (9:00 p.m.): In the midst of hip-hop and electronic beats that filled the festival, folk singer Rhiannon Giddens created an old-fashioned, banjo-heavy haven. Giddens and her band came on Tito’s stage bearing a series of string instruments, incorporating everything from violins and basses to drums and harmonicas into their performance. Giddens began the hour with “Spanish Mary,” a song off the collaborative album “Lost on the River: The New Basement Tapes” and continued the set with various covers of folk and country songs from around the U.S. Hoping to take the audience on a “musical journey,” Giddens performed lively covers of Dolly Parton and Patsy Cline songs. Throughout the performance, she had no trouble displaying her wide-vocal range, often switching rapidly from deep, drawn-out notes to high-pitched tones. Each perfect note left audience members shouting and applauding. Although she rarely playing her own songs, Giddens succeeded in selecting tracks that would get audience members dancing. While playing a cover of “Can’t Nobody Hide From My God,” the banjo-strumming had attendees square dancing and cheering. Halfway through the performance, she gave listeners a brief history lesson to set up the premise for one of her original songs. She said she was inspired to write the song “Come Love Come” by reading about slavery in the U.S. While adding a few more of her own tracks to the set list would have improved the performance, Giddens succeeded in impressing with her vocal range and banjo skills. 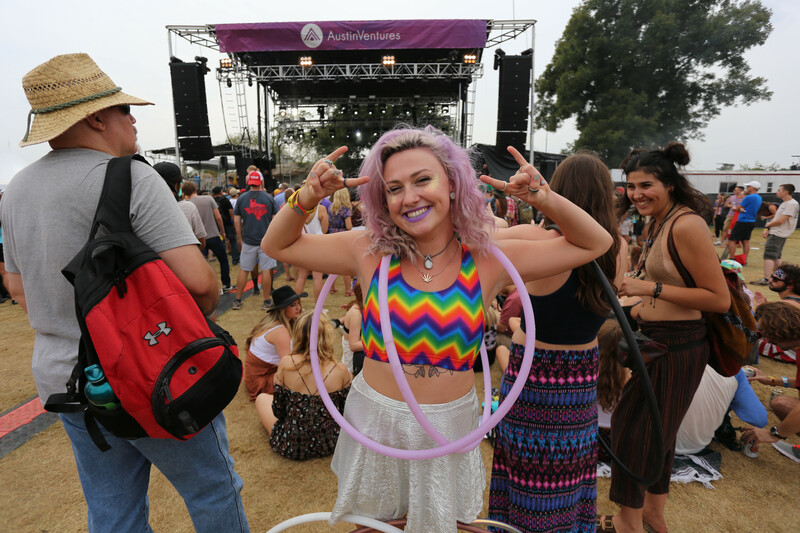 Update (8:03 p.m.): As thousands of people enter the Austin City Limits Festival around her, Austin-based artist Jennifer Leleux only has one thing on her mind — her dream sewing machine. 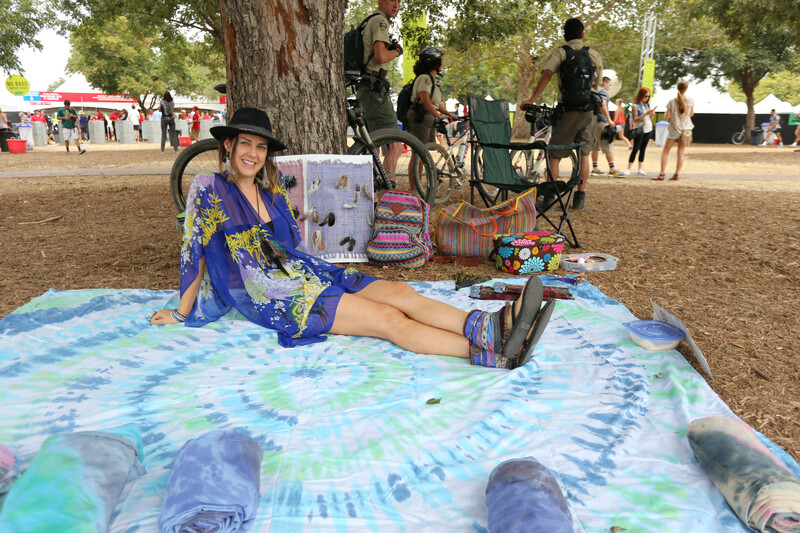 Leleux, who sold tye-dye blankets, boho boot covers and feather jewelry outside the festival, said all of the money she earned today was going toward the purchase of a thousand dollar sewing machine. "I've been crafty my whole life," Leleux said. "I'm ready to quit my nine to five and start doing my dream job." After working on a Pinterest project with her niece, Leleux said the project eventually evolved into her signature product. “I found a project on Pinterest and did it with my niece. That ended up becoming Kissy Boots," Leleux said. For the past two months, Leleux has been working on her line of Kissy Boots — handmade boot covers made out of up-cycled materials. "Nothing is new," Leleux said. "Saving stuff from the dump and making it into something beautiful is my passion." Update (6:35 p.m.): Throughout her career, American singer Rhiannon Giddens has formed Grammy Award-winning folk band Carolina Chocolate Drops and collaborated with musicians such as Marcus Mumford and Elvis Costello on “Lost on the River: The New Basement Tapes.” In 2014, T. Bone Burnett approached her about joining The New Basement Tapes, a project in which musicians wrote songs to uncovered handwritten Bob Dylan lyrics. Since 2013, Giddens has been pursuing a solo career, releasing her first solo album, “Tomorrow is My Turn,” in February. The Daily Texan spoke with Giddens at Austin City Limits about her work throughout the years. Read The Daily Texan's Q&A with Giddens here. Update (4:12 p.m.): As the stars rock out on stage, festival-goers from all walks of life cover the park. Check in periodically throughout the weekend to see who they're listening to and what their stories are with our series ACL Off-Stage. 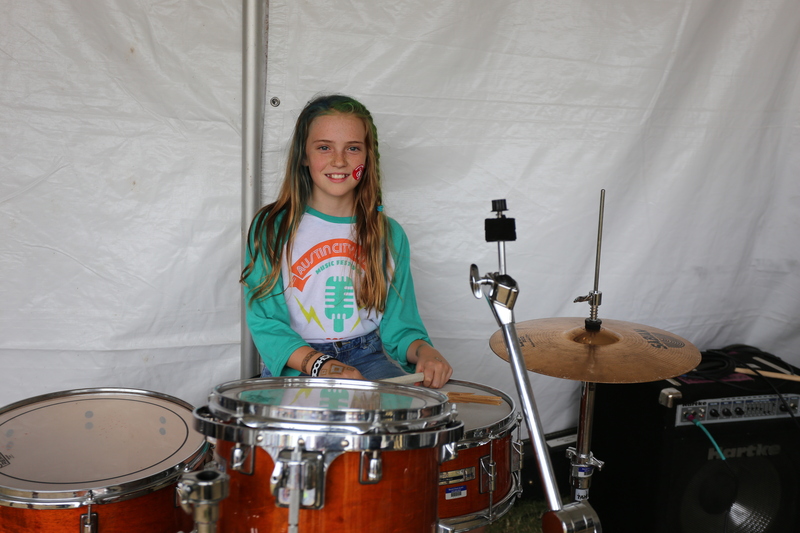 “I’ve been doing this every year since the beginning of the festival. I work in the playscape across the street as a clown. I just move across the street and take the makeup off. I started making balloons 35 years ago. Why wouldn’t you do it? The silliness, the balloons, the juggling — it’s magic. I like to make anything. I like challenges. The hardest thing I’ve ever had to make was a Cat in the hat that was ten feet tall standing on a globe holding a rake and a fishbowl." “The Beatles and Weezer are my favorite bands. I want to be a musician when I’m older and play either guitar or drums. I like the guitar because you can have fun just jamming out, but with drums you can keep the beat of the song." I’ve been hula hooping for a year and seven months now. I kind of just wanted to find my flow. This is my first time at ACL, I came up from Baton Rouge. No one’s said anything to say about my hula hooping yet, but I’m getting there. Take a look at our schedule for today, and join us in seeing some of the best. 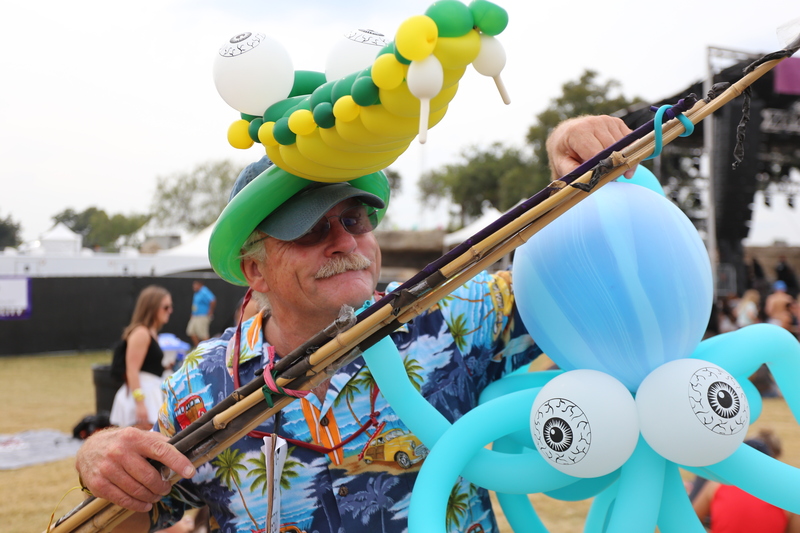 Update (12:30 p.m.): Over the course of this weekend, we'll be live-blogging Austin City Limits Weekend Two. Let’s see which artists out-do their performances last weekend and which ones bring something new to the festival. Follow Daily Texan reporters, photographers and editors as we post the highlights of our work here. For minute-to-minute coverage of the best and the worst that ACL has to offer, follow us on Twitter at @thedailytexan.